“That last week at school before the Christmas Holidays, death was in everything. Nash believed that the hardest thing she would have to do this school year was convince the head that she was the right girl for the Head Girl job. That was, however, before Bathory Girls for School became the place she feared most of all. First there was the beast at the side of the netball court. then strange things start happening at the school. As Nash hears more about the mythical Beast of Bathory and most the school goes home for christmas there re more and more shivers running down Nash’s spine, and they weren’t anything to do with the snow. 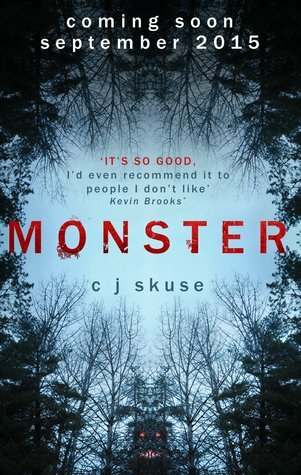 I’m a huge CJ Skuse fan so when I heard last year she was writing a boarding school thriller I got very excited. Boarding school novels are always good reads and this one, written by one of my favourite authors, promised to be great. I got a copy through for review and dug in as soon as I could. Of course reading with a baby around isn’t exactly easy so I had to fit it in when I could but it was worth ever captured page. Monster promises to be a bit scary and I honestly didn’t expect what it turned into. Talking about the story is almost impossible without ruining it for anyone who hasn’t read it so I can’t say much about that. At first I was unsure about the beast and if it was even real or not but as the story went on and I found out more about what was actually going on I got more and more drawn in and soon became hooked. As soon as the Christmas Holidays started it ramped up and I could barely put it down! It turned round completely and I didn’t see any of it coming. I liked the introduction of Leon and I loved how relationships between Nash and some of the other characters panned out. The fast paced conclusion of the story was exactly what I wanted from this book and I pretty much spent the last 100 pages hanging onto the edge of my seat. The setting of the book really helped bring the story on and things like the time of place and just how secluded Bathory was really added to the tension. The myth of the Beast was intriguing and I liked how that plotline extended. It would have been cool to have found out exactly where the beast came from, but I’ve heard rumours about this kind of thing in the English countryside all my life so I was quite happy to read about it in a YA book. It was definitely another great book from this author, not my favourite but still more than worth a read. If you like boarding school books and thrillers with more than a little bloodshed in them then this book is definitely for you. Theres a little bit of added sass and humour in there too and for anyone looking for great characters with attitude, Maggie will be a firm favourite. Monster will be published on September 24th by Mira Ink. My copy was sent to me from the publisher in exchange for an honest review.